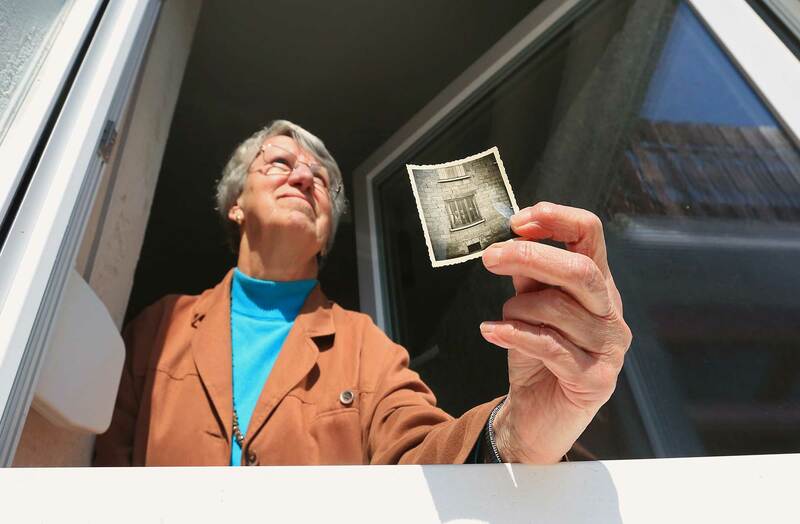 In Enkenbach, Germany, Rainer Schmidt holds a photo of Pax volunteers walking down the same street where he and others continue to live in houses built by Pax. 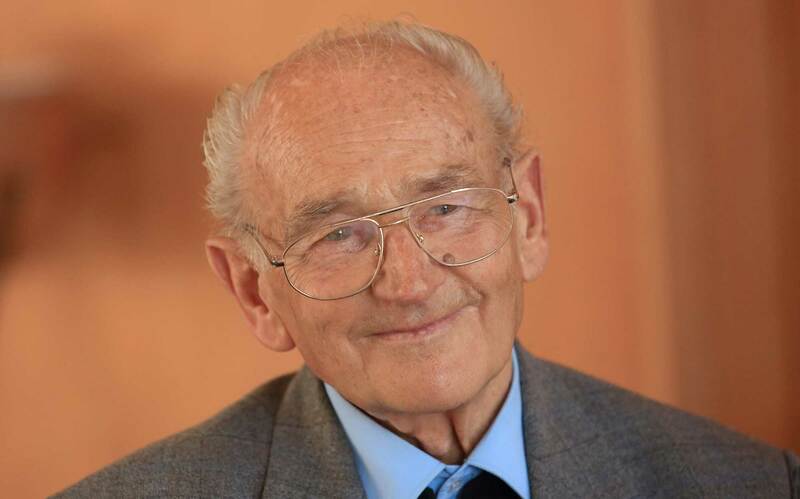 At the the age of 85, Artur Regier vividly remembers the night he fled his family’s West Prussian farm. It was 1945, and he was 15 years old. With gunfire from the Russian army less than two miles from their home, he, his mother and two brothers galloped away on horseback. It would be nine years before they had a home of their own again. They sailed on the Baltic Sea with more than 2,000 refugees on a boat built for 250, then spent three years living in a Danish camp. Finally, in 1954, they moved into their own home in Enkenbach, Germany. That home was built by young volunteers in Pax, an MCC program that provided Mennonites in the U.S. an alternative to military service and, in post-war Europe, helped to rebuild war-torn areas and to offer a bright spot of hope. In Enkenbach alone, the efforts of Pax built 115 housing units and a building for the Mennonite church. Enkenbach is full of stories like Regier’s — accounts of people who were forced to flee as youth and built new lives with the assistance of MCC and its Pax program. Edith Foth holds a photo of herself and her parents, Cornelius and Helene Foth, in the same window where the image was taken nearly 60 years ago. Edith still lives in the home, built by Pax, that the family moved into when they came to Enkenbach after being displaced during World War II. Or there’s Edith Foth, who left home with her family when she was just 10. “We thought in two days we’d be back home, but we never made it back,” she says. Her family moved into a new Pax-built home on the first Sunday of Advent in 1954. “That was a great moment for us, and without MCC’s help, it would have never been possible for us to own a house again after World War II,” says Foth, who worked alongside Pax volunteers for several months. Their legacy lives on in more than just the physical homes they built. Children gathered at the Pax house for snacks and Bible study, listening to the radio and playing games of table tennis in the basement. Pax participants started their own choir, and refugee youth joined in—forming the seeds of what today is the Enkenbach Mennonite Choir. Ervie Glick of Harrisonburg, Va., was a member of that choir while he served with Pax in Enkenbach, and he also remembers playing hockey in the winter with the youth from the Mennonite church. But his most vivid memory from that time is of Monday evenings when the Pax members went in groups of two to spend the evening with a family who had moved into one of the new houses. 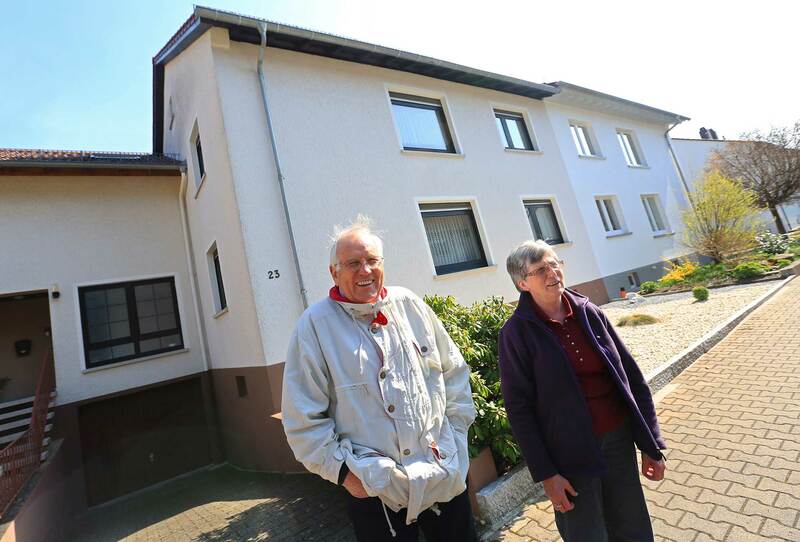 Klaus and Greda Wiens stand outside their home in Enkenbach, which was built by Pax. The Pax program provided an alternative to military service for Mennonites in the U.S. and helped rebuild war-torn Europe. MCC relief in Europe wasn’t only in Enkenbach. Shortly after the war, food, clothing and relief supplies were distributed across Germany, and in the 1950s Pax built homes in several areas around the country. France also received help rebuilding damaged areas. Many in the small town of Geisberg remember 1946 to 1949, when MCC relief workers built houses as well as a nearby home for orphans. 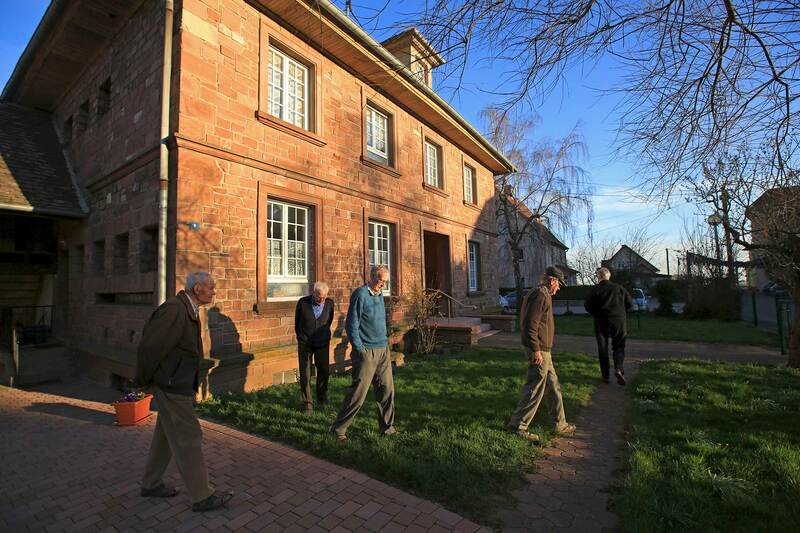 Alfred Hege, left, Rene Hege, Jean Hege, Oscar Hege and Théo Hege walk around what was once a children’s home in Geisberg, France. This building is one of many that MCC helped to build in the small village in the late 1940s. Here too, the memories are of more than construction. Though Théo Hege was only seven when the MCC workers arrived, he remembers having them at his family’s home on Sundays and receiving candy or stamps for his collection. “They introduced us to Christmas carolling as well as the sunrise service on Easter morning,” he says. Now that he’s older, that relationship with MCC remains — though Hege is on the other side of the equation. Agnes Hirschler and Jean Hege, left, watch members of Geisberg Mennonite Church load a shipping container with relief supplies collected and packed by the church. The shipment, sent through MCC, was coordinated by the relief committee of the Swiss Mennonite Church (Nothilfe Gruppe, or Emergency Group) along with French churches. It contained 1,500 hygiene kits, 65 handmade comforters, 294 purchased blankets, 791 relief kits and 144 pairs of handmade socks along with supplies like towels and sheets. 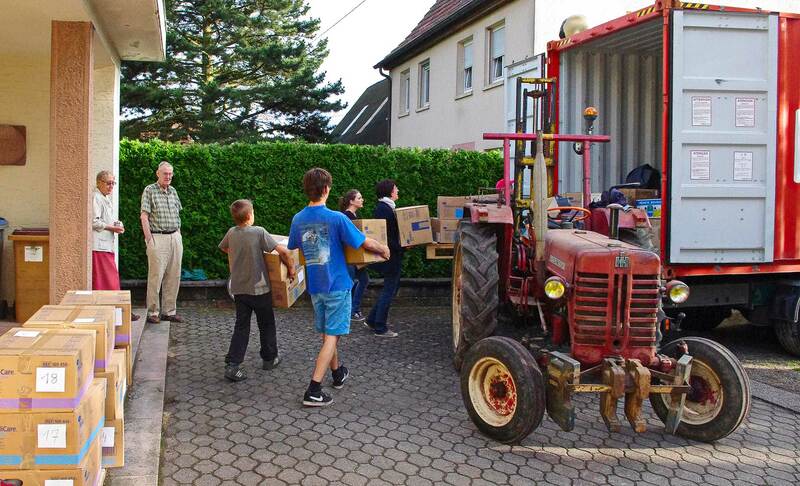 In Germany, the Enkenbach Mennonite Church, where Regier, Sauer and Foth attend, also has donated money and supplies to MCC’s relief work through Mennonitisches Hilfswerk (Mennonite Relief), an organization of 60 Mennonite churches in Germany. Now, 70 years after the war’s end, it’s a way that many whose communities received help through MCC can give back — passing on the blessing that they received to others whose lives have been upended by conflict. Emily Loewen is a writer for MCC Canada. Nina Linton is a photographer from Charlottetown, Prince Edward Island.